Un minestrone di Arts e Crafts, crafted in Italia. 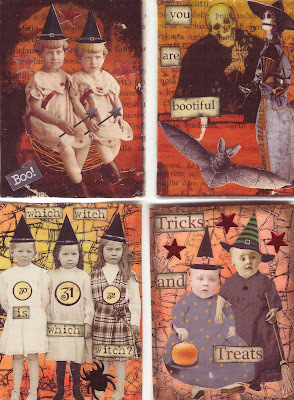 HALLOWEEN swap on ATCs for all . Top 2 atcs I've used gel skins ( explaination in previous post ) and the bottom atcs I've used the melted wax crayon for background and then rubber-stamped.